Running the cue ball around the table is always dangerous! We can have the cue ball stop far away from our next shot, or worse we can have the cue ball fall in to a pocket. All bad things for our winning percentage! To help us avoid this outcome, I’d like to share a little secret with you. Any time the cue ball passes along a diagonal line through the center of the table, there is no scratch in the shot. Knowing this gives us a great route to move our cue ball up and down the table without worrying about a scratch. Here is what this route looks like on the table. Notice we pocket the one ball by using some left spin with a little top. Once we pocket the one, the cue ball comes out of the corner and passes through the center of the table. This works best when the object ball is no more than a ball's width away from the rail. Depending on the cut angle, you may need to add or decrease running english. Now, here is a little secret. Any time the object ball is near the short rail, and between the corner pocket and the center diamond, a rolling cue ball with running english will pass through the center of the table. No scratch and a nice route to get our cue ball back down table. The neat part of this route is that it also works with a three rail route as well. 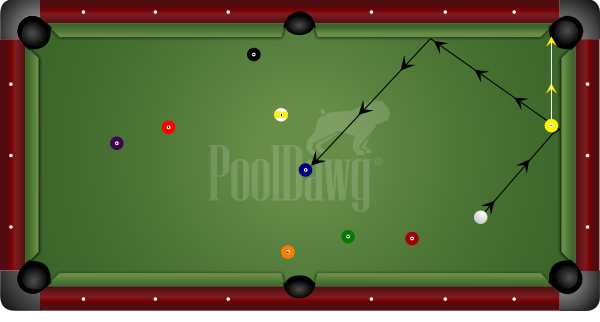 Any ball on the long rail from the corner to 2 diamonds away from the pocket if hit with a rolling ball with running spin, will travel 3 rails through the center of the table. Frank Says: "For optimal cue ball control, chalk often with the PoolDawg Blue Master Chalk to avoid miscuing or scratching!" Let’s expand this idea a little more. The more general rule is that any time the cue ball approaches the short rail at about a 45 degree angle with running spin, the track line will pass through the center of the table. 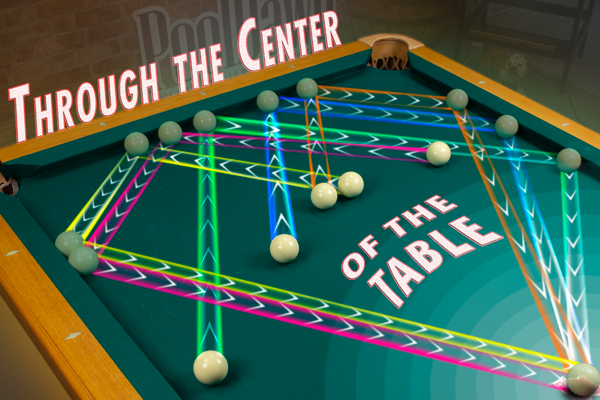 Here is how we can use that idea to move the cue ball and avoid a scratch by passing through the center of the table. You can use the same technique as above to make sure the cue ball passes through the center of the table. This time, you may need to emphasize speed of stroke and amount of running english in order to pocket the ball and send the cue ball off the rails to the center of the table. Here, we draw off the one ball and pull the cue ball into the rail at about a 45 degree angle. Voila! The cue ball tracks two rails through the center of the table. Notice how I used more draw than spin as the cue ball picks up some running spin from contacting the one and I don’t want to miss the shot!